Your source for expert advice on the collection and appraisal of fine art. The fourth annual Dallas Art Fair was in town this last weekend and was an incredible opportunity to see and purchase the latest in modern and contemporary art. The almost 70,000 square foot space of the Fashion Industry Gallery held over 75 prominent national galleries, international galleries and art dealers, each showcasing the very best modern and contemporary pieces from their collections. Well-known galleries from New York, California and Chicago were represented, as well as some of our best local galleries; Talley Dunn, Holly Johnson, William Campbell, Valley House and Conduit Gallery. This fair gets better every year. In addition to walking through the massive two-story gallery space, this year viewers we able to choose from demonstrations, panels and discussions, tours, a film festival and receptions. This event offers a great opportunity to those interested in modern and contemporary art to see work represented from all over the world by great galleries and artists all in once space- the Dallas art community really is spoiled to host the fair every year. As I spent the afternoon meandering through all the galleries, I kept my eyes open for trends and show stealers; you know, those pieces that stick with you and etch the artists name into your memory, the ones that have impact. For trends, this year was surface play. A huge factor in modern art is experiencing it, literally being in the same space as the piece, and this has a lot to do with the artist’s use of surface. Layering and thickly applied paint were constants amongst the galleries. This close-up of Dennis Hollingsworth’s 71 x 63″ oil on canvas “Come On In” illustrates what I mean by paint being applied to obtain a quality of surface play. 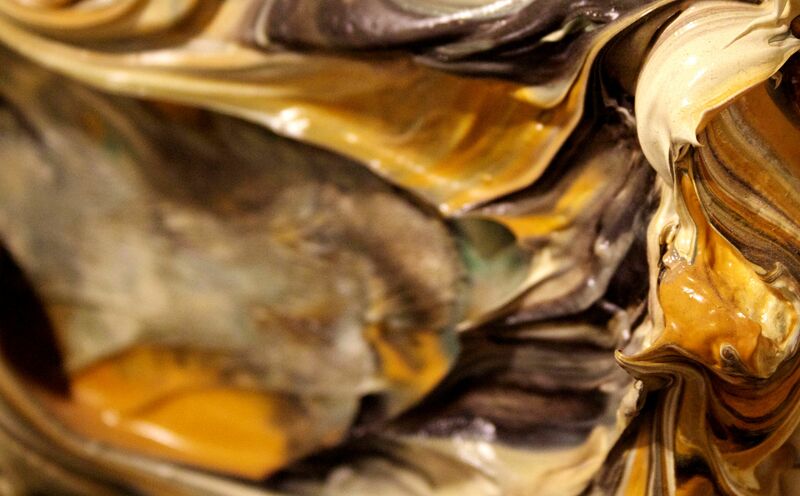 The paint reaches up from the canvas, giving dimension and creating shadow, and the color still has its role within the thickness of the paint itself. Norbert Brunner’s work, shown by Claire Oliver Gallery in New York, uses digital prints, acrylic glass, acrylic mirror, Swarovski crystals, and LED lights all layered upon one another. 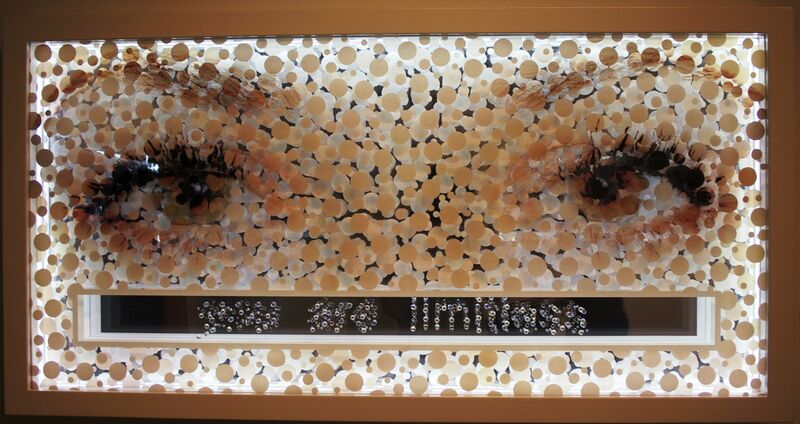 His 26 x 51 x 5″ piece “You are Limitless” depicts the eyes of a woman gazing directly at the viewer. The viewer can come in close and enjoy the complexity and brilliance of the materials or step back and take in the whole effect. The use of mirrors was a nice addition to the piece; as one looks into the large eyes and reads the moniker below, they are reflected back into the work- photos do not do this piece justice. Standing in its presence is the only way to get the full impact. represented by Cris Worley Fine Art- Dallas, had a great and almost whimsical surface quality that made me want to reach out and drag my hand across it. 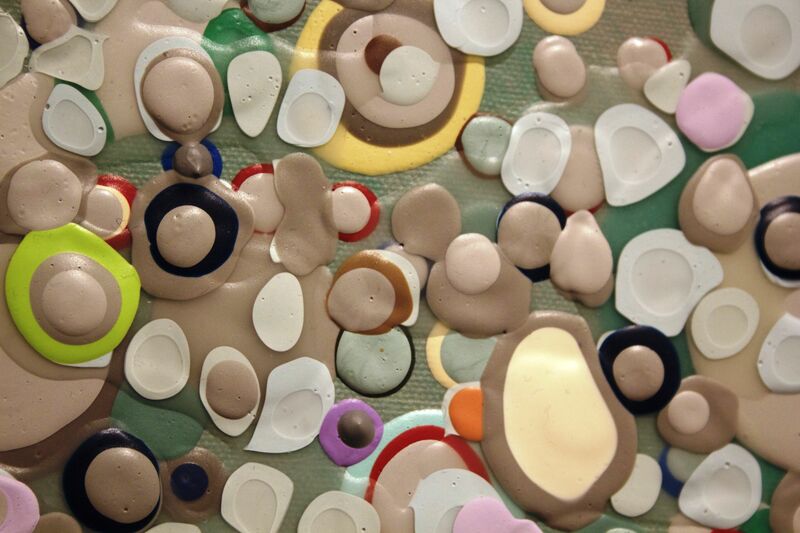 Hundreds of polychromatic irregular circles cover the canvas and seem to fizz and bubble out towards the corners. The shapes are stacked atop one another and compete in both color and form, giving the canvas a great amount of movement as the eyes jump from the bright yellow halo of a partially covered circle, to a purple drip or lime green ring. Again, the surface play and layering of acrylic engage the viewer and draw them in close to experience. Ok, the show stealer . . . This piece by William Betts (from Holly Johnson Gallery – Dallas) wins the prize. The 60 x 40″ piece encompassed all the aspects I consider to make a great contemporary art piece. 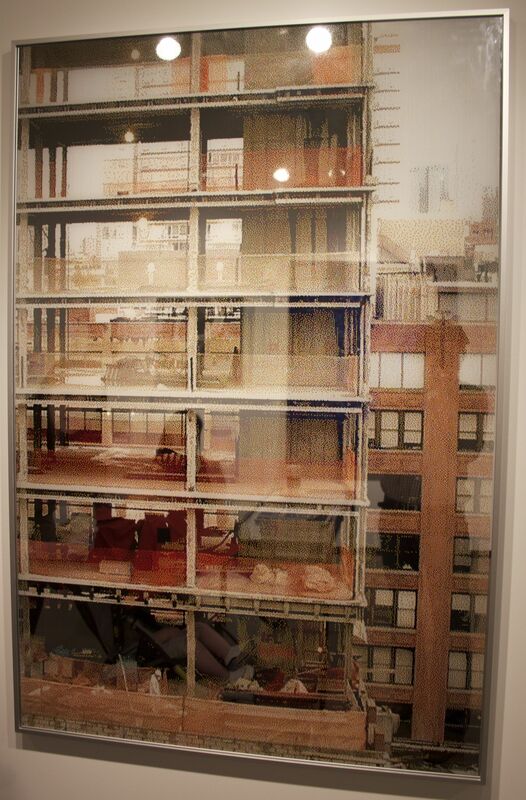 Betts’ “View from The Standard, NY” is listed on the artist tag as an ‘acrylic paint on reverse drilled mirror acrylic’. The image was inspired by a photograph taken by the artist, but the paint itself is embedded beneath the surface of the picture plane. 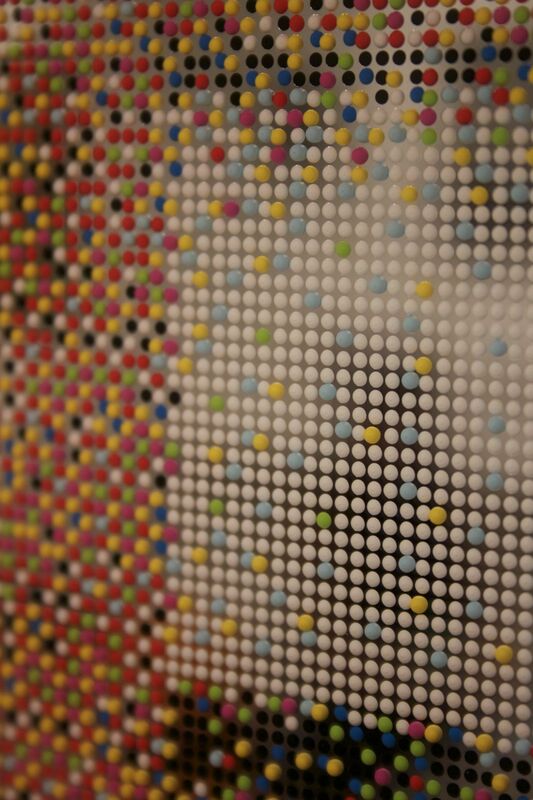 After drilling thousands of small, shallow holes into the back of the mirrored Plexiglas panel, the artist fills the holes with differing colors of acrylic paint. 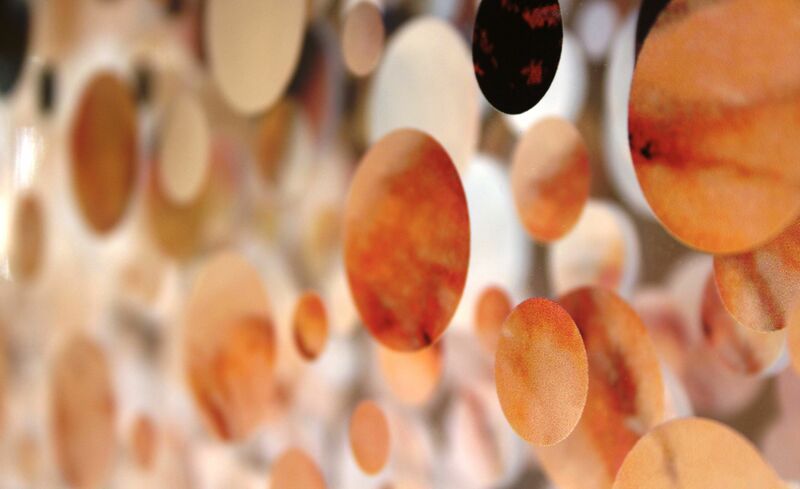 Each spot of paint is a three dimensional unit encased beneath a transparent surface. Betts won me over with this very creative approach to the mirrored glass as his surface. It is industrial and urban in its subject matter, depicting The Standard of New York; it is engaging with its use of the mirror, once again literally bringing the viewer into the experience – making one a part of the piece; it has fantastic and highly engaging surface play with the new approach to pointillism, the artist’s tweaking of the dot grid gives depth and a layering effect. 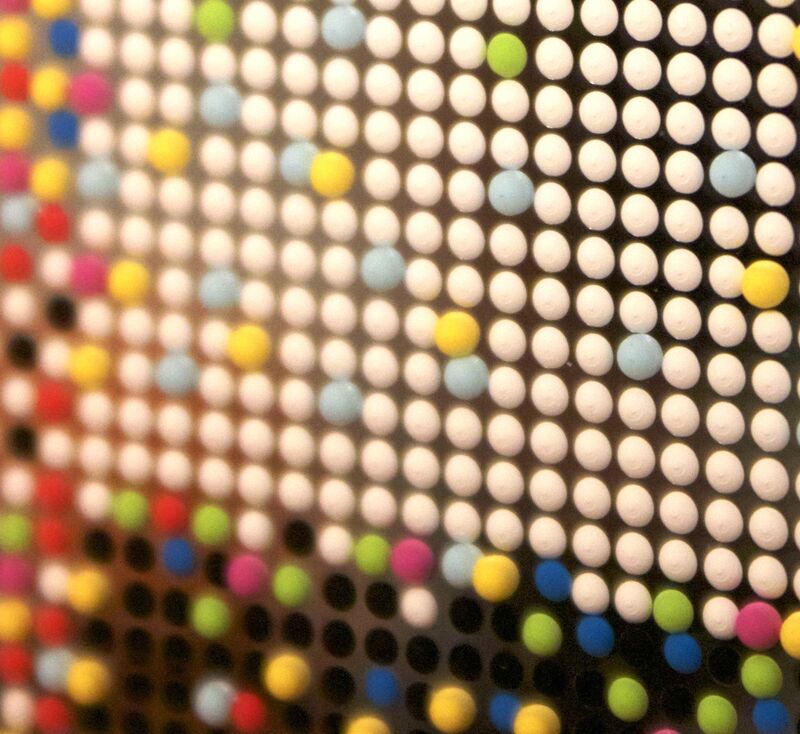 Notice in the extreme detail view that the dots optically advance and recede. Black dots are shallow and appear flat atop the glass. Then the dark blues appear closer as the holes for that color were drilled deeper. Then the green, the red, the light blue, pink and then yellow in a gradual and progressive three-dimensional construction on the panel, the colors literally reaching out to you. From afar, the piece is a somewhat nebulous scene of a building in New York. The haze created by the dot pattern forces the viewer to explore and as one gets closer, the city scene breaks apart and a color field grid is revealed, almost a piece within a piece. After talking with the gallery representative, I learned this was one of the artist’s more colorful pieces. He usually works in a monochromatic scale of whites and grays. For me, this piece was a highlight of the show. A few of my other favorites . . .
Robert Jackson’s “Water Balloon Fight”, is a 36 x 48″ oil on linen. Jackson’s pieces are colorful and whimsical, the artist’s conceptual still life works usually explore deeper themes below their fun surface. 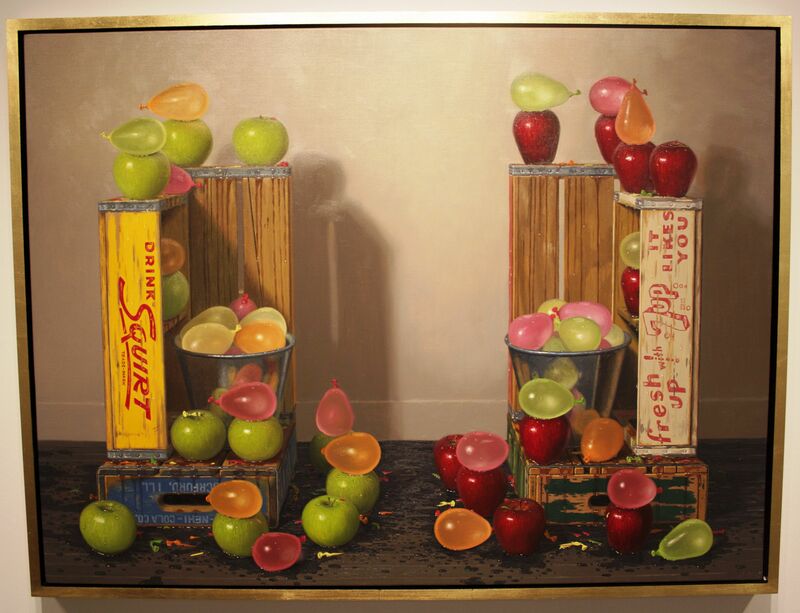 In this piece, shown by Gallery Henoch from New York, green apples and red apples battle it out in a water balloon fight. Jackson sets up these elaborate, funky still life groupings and paints from them; one can only imagine his studio space. 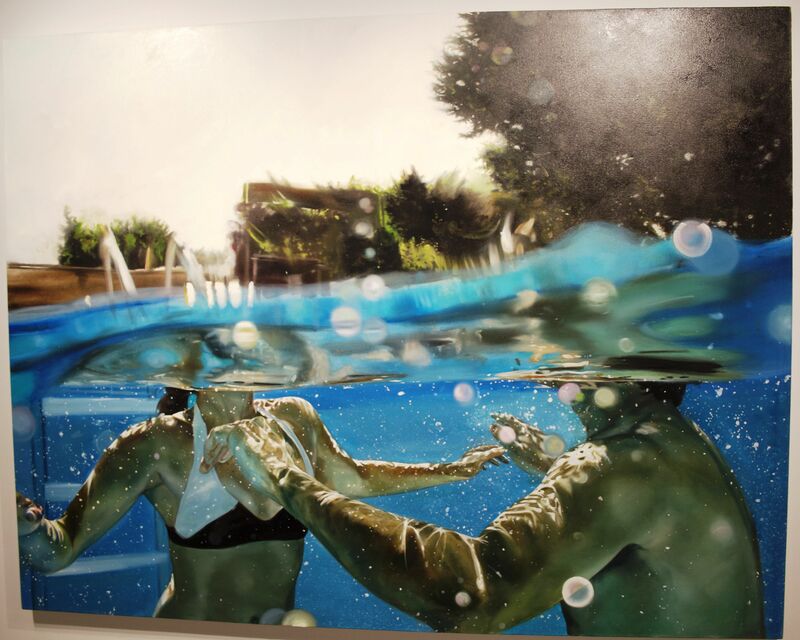 “Much Clearer Down Below”, 60 x 78″ is an oil on canvas by Eric Zener. I knew Zener would be showing at the fair and I sought out his work. His underwater pieces have an incredible photorealistic quality. His use of light and reflection is beautiful. In this piece a man and a woman swim in the clear blue water of a pool, both of them frozen in a moment as the water’s surface divides the canvas in half horizontally and blurs out their faces. Zener pieces have a calm to them, a soothing ability. When I look at them, it is as if I hear the sound waves around me become slow and lazy from the water distorting them. 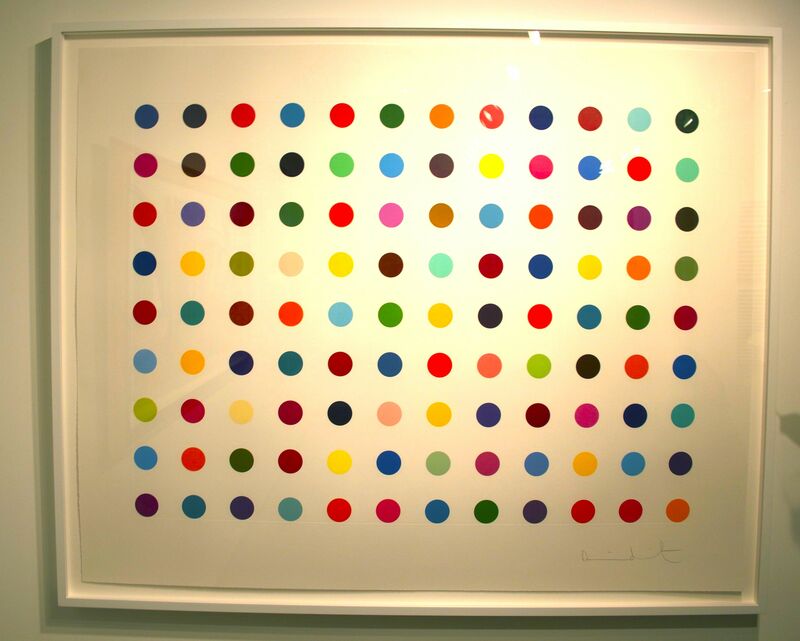 Also on my list of favorites- one of Damien Hirst’s spot prints. Go ahead, roll your eyes; but I am a sucker for these and I make no excuse for it. And of course no list of highlights would be complete without a nod to David Bates. 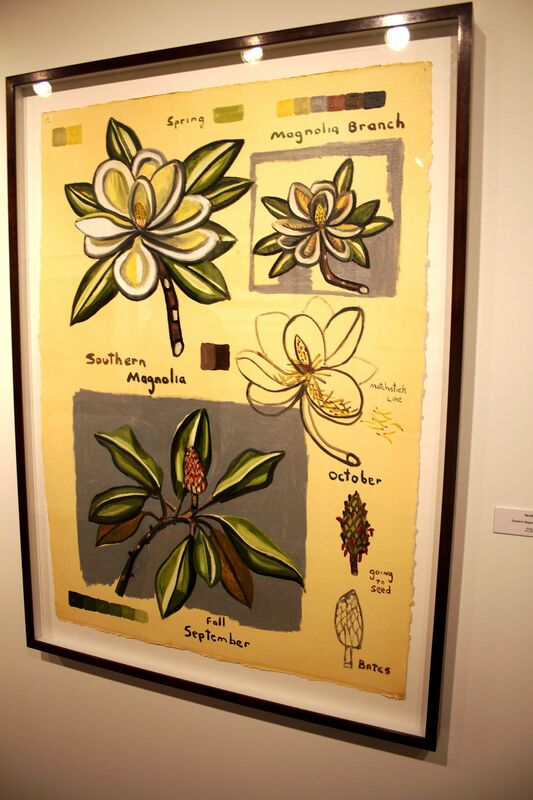 Tally Dunn had some of the artist’s early works from 2004, the paintings on paper “Water Lily” and “Southern Magnolia”. Both of these pieces employ the thickly applied paint and intense black outlining so distinctive and recognizable to Bates’ work. There were several Bates’ paintings and prints at the fair, but these were the most interesting of the selection. I saw several ‘sold’ stickers on pieces throughout the gallery on opening day. That is a good indicator the galleries were having success with buyers. If you missed the Dallas Art Fair this time around, don’t make that mistake next year. This is one of the best local contemporary shows of the year. This entry was posted in Uncategorized on April 26, 2012 by Art Advisor. 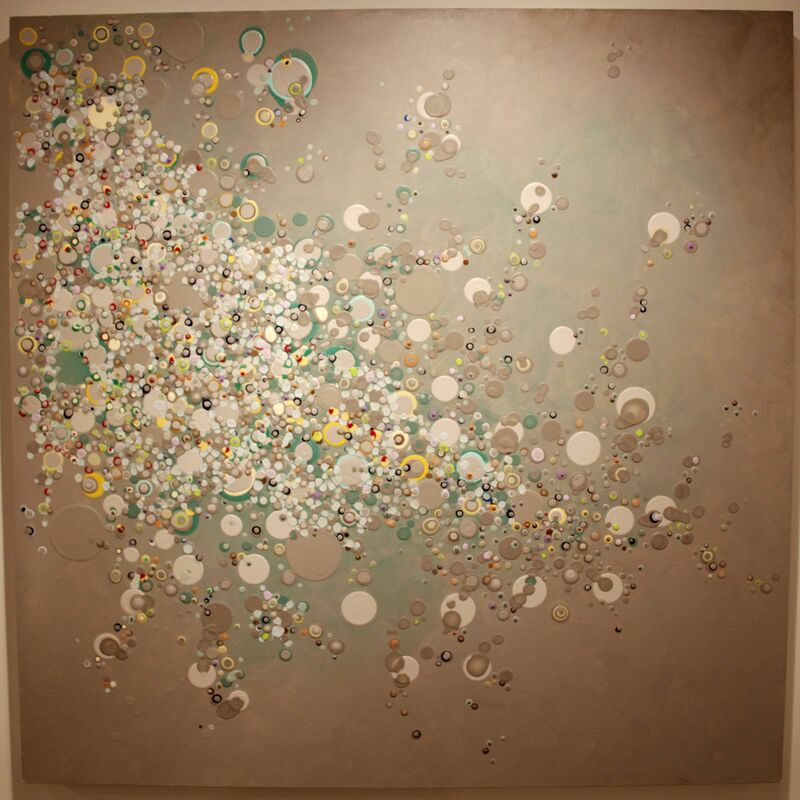 Fourth Annual Dallas Art Fair | Art Advisor’s Blog? I just want to read through even more regarding it. Thanks for your time. The Dallas Art Fair – 2014!